Jobs on cruise ships - Smooth sailing or rough seas? Without going into too much detail, I was considering taking a job on a cruise ship (as part of The Big Trip II). And then I found websites like this and I thought, "Hmm... looks promising". But then, further research on the net showed me this and this. Is three months slave labour such a bad thing? I need to talk to people who have been there, done that. Firstly, ratings for the week that episode 4 are now out and... well, Table for Two isn't in the top 10 list for its category. On the other hand, the lowest listed show (Euro 2004 Highlights) pulled in 30,000 viewers, which is around what T42 normally gets. For comparison, the Euro 2004 finals had 108,000 viewers, and even that was beaten by 3R (115,000 viewers). Top of the heap was Pilihan Senario with 3.241 million viewers. Secondly, tonight is episode 5, That Thing You Do. Synopsis says, When Sue finds out that Adam has done 'that popcorn thing' with another girl, she decides to test him to see if he's being honest with her. You also get to see the inside of Astro radio studios and Fat Fabes' acting debut. There was a bug in Internet Explorer which meant that when I first posted the crocodile article below, there was a picture of a crocodile without any text accompanying it. There is text to the right of the picture - when I tried scrolling down and then back up again or highlighting the 'invisible' text to the right of it, it came back. I've seen this in version 6.0.2800.1106IC (hey, they come up with the version numbers, not me). If you moved away from IE to view another program in full-screen, when you got back to IE, the text disappeared again. Now that I have an extra post above it, so article is pushed down and the right-hand side menu is no longer next to it, everything seems fine. Does anybody know why this happens? I've looked at http://archivist.incutio.com/viewlist/css-discuss/10920 but... it's not 100% clear what it means. Also, this was written in August 2002, so you'd have thunk it would have been fixed by now. All this, of course, is incredibly annoying. But Firefox has it's quirks as well (which I'll write about when I get the time to mockup a page). Crocodiles have been spotted in the Klang River, next to the busy Federal Highway. Up to four may have been seen although the Wildlife Protection and National Parks Department (Perhilitan) can only confirm the existence of one. This is absolutely incredible. 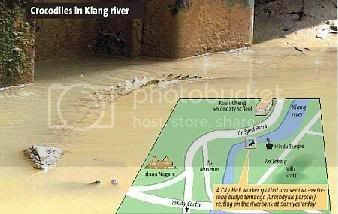 Maybe we should set up visitor galleries by the Klang river. Have "See A Croc, Feed A Croc" boat cruises. Crocodile wrestling competitions. My GMail account has now reached the 1% milestone. I use it to channel what I call "solicited Junk Mail" - all those newsletters and notifications that are not personal mail - and have been doing so since 24 April 2004. I haven't deleted a single email yet, and at this rate I don't have to delete another email for (quick mental calculation) about 25 years. And if they want to scour through my email for personal data mining, the best of luck to them. I read this and was just... speechless. Then I giggled a little. Anwar's operation - is it about him? Or about Human Rights? This post is in direct response to Suara Malaysia's posting about this issue. The quotes in italics in between are from that posting. For another viewpoint, read the SUHAKAM press release at http://www.suhakam.org.my/bm/media/terperinci.asp?id=74 (you have to read the PDF file for the full text). Personally, I agree that Dato' Seri Anwar should not be accorded greater rights than any another prisoner, so all arguments made for him should apply to all prisoners. I believe that this debate is especially heated because of the personalities involved. I also agree that the decision will set a precedence. The point here, to me, is the freedom a prisoner has in deciding how his health is managed. For long-term prisoners, this is a critical issue. Any assumption made that laws should be bent to accommodate a single man's wishes is missing the point: that this is an issue affecting all, brought into sharp focus by this individual case. In fact, I'm not sure there is such a law. The law merely says that if a prison has inadequate facilities, the prisoner may be removed to a government hospital. The Prison Act seems to make no statement as to what should happen if the government hospital has inadequate facilities (nor as to who decides this). > believe that he's a political prisoner? I think you mean "what grounds are we letting Anwar go _abroad_". I think the grounds are that he is a prisoner under Malaysian Law, and as such, the Government is partially responsible for his well-being. The debate is now to what extent. > If we do allow him to go to Germany, will we allow any other ordinary prisoners to seek overseas medical attention? If the circumstances were similar, the answer should be 'yes', shouldn't it? > to seek treatment overseas? "In addressing the concerns of the authorities, (Dato' Seri Anwar Ibrahim) has assured SUHAKAM that he is willing to bear all risks and expenses should he be allowed to pursue his personal choice of medical treatment overseas. DSAI has also intimated that he is willing to abide by any conditions imposed by the Government including those restricting him from taking any actions of a political nature." The key phrase here is "all risks and expenses" - I assumed this included "costs for government precautions". > Who's to foot the bill for the precedence created if they let him go? This statement isn't clear what precedence you're referring to - that prisoners are allowed free access to medical care of their choice? That the Government will have to entertain every request for overseas medical treatment? Why is either a bad thing? SUHAKAM notes that DSAI has been provided with the best of medical care at KLH and the Sg. Buloh Prison and this was acknowledged by DSAI during SUHAKAM's visit. However,SUHAKAM reiterates that from the medical, legal and human rights perspectives, DSAI should be allowed to exercise his right of choice of medical treatment. Somebody said, "Hey, your RSS feeds all cut off one". Yes, it's because I chose to, so that aggregators wouldn't get swamped by my ramblings. Anyway, I've looked at it again, and decided that I don't post that much anyway each time, so it's worth expanding it. Also, this posting is a way to see if the change has worked. xml feeds work great now. cheers. Just updating stuff about Table for Two. They showed episodes 3 and 4, and so far the stuff has been okay. Episode 3 in particular wasn't very good, but the next one was fairly touching with some laugh-out-loud moments. Just my two cents. Malaysian Idol repeat on TV3 with 72,000. The Portugal vs Holland Euro 2004 game with 35,000 viewers. 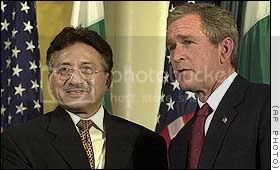 U.S. Urges Pakistan to Find Bin Laden Before Elections? This story looks to be breaking in the US as I write this. According to one source in Pakistan's powerful Inter-Services Intelligence (ISI), "The Pakistani government is really desperate and wants to flush out bin Laden and his associates after the latest pressures from the U.S. administration to deliver before the [upcoming] U.S. elections." I know that many governments ramp up high-profile projects just before the elections. Doesn't make it right though. If only voters had longer memories. Just read this article on possible (read: probable) plagiarism of a weblog entry. I occasionally write for a weblog called Cakap-Cakap Bola and Sashi is one of the more entertaining contributors to the same blog (even if he does support Liverpool). Anyway an article in The Star seemed to have a few lines eerily similar to one of Sashi's blogs. An article that was published 13 days after Sashi's entry. An article that wasn't written by Sashi. OK, so it was only two lines, you might say. But a single idea lifted wholesale is bad enough to blot reputations. And there could have been some strange rip in the continuum that meant that Sashi was inspired by quantum interactions due to retarded waves travelling backwards in time emanating from The Star journalists. But I don't think so. Mr. B. Sanjeevan of The Star, Malaysia, you have some explaining to do. Just doing my usual, "don't forget to lock the doors, stay at home and watch Table for Two at 7pm on TV3 this Saturday". The synopsis says: "Sue is offended when Adam has no intention of bringing her along to a family dinner". Also, Bobby brings in his son (played by Douglas Lim) as an intern. Just sayin', so you know. So, it's somewhere between a football game and a wrestling match. hey, found ya! u've practically got a "shrine" of T42 here, don't you? ^__^ cheers.